We’ll order you 275 pairs of chopsticks! Now who could turn down an offer like that? Our session at the Music Education and Drama Expo at London’s Olympia at the end of February involved over 150+ delegates being introduced to one of our most popular Just Play resources – Just Play Chair Drumming – courtesy of an invite to our managing director, Fran Hannan from the team at Rhinegold. Delegates at the workshop learnt how to co-ordinate hands and feet to simulate drumming basics using a chair and chopsticks with co-ordination and concentration in varying degrees! 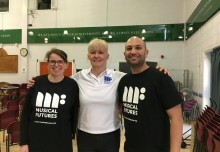 Many thanks to the fantastic Jane Werry (Director of Music, AST, SLE and Musical Futures Trainer) from Hayes School, Bromley who co-lead the session and dealt ably with the scramble for instruments by overexcited delegates! As well as offering opportunities to develop skills on ukulele, guitar keyboard, bass and drums the Just Play resource offers many other possibilities for exploring musical skills. 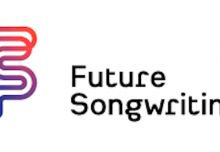 Many of the playalongs can be used as inspiration to create classroom versions of particular songs using both instruments plus tuned and untuned percussion. 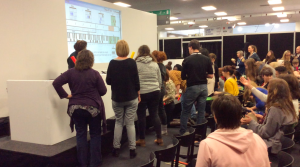 Having honed rhythmic skills using chopsticks and chairs the delegates moved on to creating a rhythmic groove for Ed Scheeran’s ‘Shape of You’ playalong and eventually a full version of the whole song complete with chime bars, egg shakers, guiros, woodblocks, boomwhackers and ukuleles. It may not quite have been up there with the version by Walk Off The Earth or even Jimmy Fallon and Roots, but it’s amazing how much fun we all had with chopsticks and some tuned and untuned percussion instruments. Why not give something similar a go with your classes – a great way in to composing and improvising using material they’re familiar with?